Every Sunday morning, a few people line up after services at St. Paul United Methodist Church and greet Robert Patterson as "the Reverend." He's never had any ambition to be a pastor. But some habits, apparently, are hard to break. It's his wife, Sheron, who is senior pastor of the downtown Dallas church. It's the sort of thing men get used to when they are married to the pastor or rabbi. Men may not sense the same expectations to serve the congregation that are directed at the wives of clergy, but they've often had to break new ground – and old stereotypes. I don't play the organ. I don't bake cookies. I have simply been allowed to be myself," Mr. Patterson said. "The congregation has accepted the fact. While it's unusual, it's been comfortable for me." In the past, many congregations considered a clergy spouse to be a de facto part of the staff – a sort of two-for-one deal. Pastors' wives led the choir, taught Sunday School and organized social events. They were at their husbands' sides every time the church or temple doors were open. With today's dual-career families, those old patterns no longer hold. Spousal roles, as a result, are less clearly defined. And for men who are the "first husbands" of their congregations, it's a whole new ball game. Men who are married to pastors have different concerns from those of pastors' wives, according to a survey this year by the United Methodist Church. Male respondents – who made up 15 percent of the 183 spouses surveyed – said they worried about time demands and the potential for burnout by their pastor-wives. Female spouses, on the other hand, were most concerned about feeling isolated, and about the high expectations placed on them and their families. They also complained of frequent moves and the loss of friends. The United Methodist Church, which has more than 150 female clergy in Texas, provides moral support for spouses through retreats and conferences. The Rev. Pat Beghtel-Mahle, superintendent of the Paris-Sulphur Springs District, said her husband, Jerry, has been asked to serve on a panel to talk about what it's like to be married to the pastor. 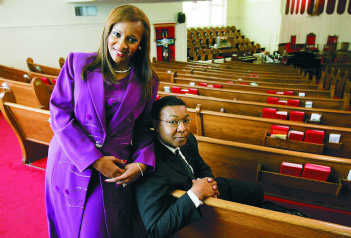 Before being appointed district superintendent in 2002, she served as senior pastor at four churches. "My husband always has had his own identity. That has made it easier," she said. "You don't expect the man to play the piano as you do a woman." Not that there haven't been faux pas. Some people still get tongue-tied when they meet her husband. "People have said to him, 'Oh, you're Pat's wife,' " she said. "I have to be willing to let him vent that. He needs to be able to say, 'I didn't like it tonight when such and such happened.' And then we go on in ministry because it's ultimately not about us." Dr. Patterson, the first ordained black woman in her Methodist conference, credits her spouse for his constant support, especially given the "tremendous sexism" in the African-American church. One male pastor, she recalled, physically blocked her from taking the pulpit during a funeral. She prayed from the floor instead. "I had no role models. I was out front alone, but I had a very loving spouse," she said. Mr. Patterson, a financial representative for Northwestern Mutual, watches over sons Robert, 16, and Christian, 12, and handles other household duties. "I can do everything but prepare a gourmet meal," he said. But at church, his pastor-wife said, there are no spousal obligations for him. Mr. Patterson teaches Sunday School and sings in the choir, but only because he wants to. "As a general rule, he is a behind-the-scenes, out-of-the-spotlight person," Dr. Patterson said. That's the way Robert Patterson likes it. He knows there are churches where the "first lady" tries to run things, but he prefers to sit in the balcony and support his wife with "loud amens." "I look forward to what she has to say each Sunday," he said. "From time to time, I'm able to ask her questions afterward. There are certain privileges you get when you're married to the pastor." As the husband of a rabbi in East Texas, Alan Coretz, has been asked lots of spiritual questions by the congregation, as if he were the expert. "A lot of people assume I'm the rabbi, not her," he said. His wife, Heidi, has been a rabbi at temples in Tulsa, Lubbock, Arlington and Carrollton. He remembers the time when women in the Jewish clergy were still an oddity. Once, when his parents announced at their synagogue that their son was dating the rabbi, many assumed he was gay. Back then, rabbis' wives, called "rebbetzin," were expected to attend all services, help in the kitchen, teach in religious schools, head up the temple sisterhood and open their homes for community meals. Reform congregations began ordaining women in 1972. Reconstructionists followed in 1974, Conservatives in 1985. Orthodox congregations still do not ordain women. By 2001, more than 500 women had become rabbis, according to Deborah Lipstadt, author of Women and American Judaism: Historical Perspectives. The number may be closer to 600 now, said Jonathan D. Sarna, professor of American Jewish history at Brandeis University. "When I began teaching at Hebrew Union College in 1979, it was assumed that single women rabbis would not be able to marry," Dr. Sarna said. "Who would date a rabbi? That assumption, like so many others concerning women in the rabbinate, turned out to be quite wrong." Alan Coretz, a network engineer and a self-described introvert, prefers to give technical support and do repairs at the synagogue. He and his wife will co-host small Seder meals and other services at home, where, they said, there's no religious hierarchy. "Alan has always been good about that. I'm a wife, mother, daughter and friend at home. Nobody goes through us to get to God," Mrs. Coretz said. "Certainly, they [synagogue members] love when Alan and Hannah come, but there's no expectation for them to be there," Mrs. Coretz said. It's a little different for Dawn Darwin Weaks and her husband, Joe. Each of them is both a pastor and a pastor's spouse. She heads up First Christian Church (Disciples of Christ) in Rowlett, a congregation of about 275. He pastors Bethany Christian Church in Dallas, where 60 to 80 people attend. Mrs. Weaks grew up Baptist and was ordained a minister, but switched denominations when she ran up against a stained glass ceiling and was informed that she couldn't serve as the preaching minister of her congregation. "I have just so much energy. Do I use it to fight or to minister?" she said. "In the Disciples of Christ denomination, it was arms open wide." Mr. Weaks graduated from seminary at the same time as his wife. They like sharing a vocation, he said, but being a two-pastor family does present challenges, such as figuring out where to work and live. The better-paying job usually wins. His wife serves the larger church now, but when they were in Lubbock, his was the bigger congregation. Mr. Weaks also is completing a doctorate at Brite Divinity School and teaches at Austin College in Sherman. Someday they'd like to be co-pastors of the same church, but he first wanted her to have the experience of being senior pastor on her own. They split the caregiving tasks for their two children, Arwen, 2, and Sam, 10 months. Sam spends two afternoons a week in his mother's office at the church. "I always ask people who want to see me, 'Is this a conversation we can have with a baby in the background or do I need to have someone watch him so we can visit?' " Mrs. Weaks said. "I have an incredibly supportive congregation. They make it possible." Yet nearly every Sunday, it's still a surprise for some visitors to learn that the pastor is a woman. Mostly, it's a happy discovery, she said, but there are those who still find it confusing or even offensive. "I've gotten past the place of judging that," Mrs. Weaks said. "The church is slow. It's always slow. There are very few denominations where you can think of the pastor as a woman. That's starting to change." 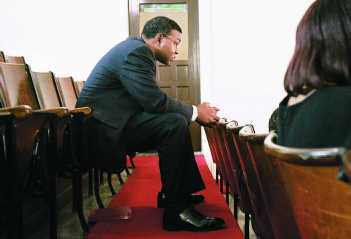 Even though he heads another congregation, Mr. Weaks feels some pressure to attend his wife's church. "The expectation is for me to be there, to be visible and supportive. Especially for visitors," he said. "If they don't see that, it feels weird. 'Yes, she's married, but her husband's not here.' "
Dr. Sheron Patterson, pastor of St. Paul United Methodist Church: "Don't listen to anybody but God." Robert Patterson: "Develop a role you're comfortable with. Believe me, church members will define your role if you let them." Heidi Coretz, rabbi of Temple Emanu-El, Longview, Texas: "We are a partnership family. I'm not his rabbi." Alan Coretz: "It never crossed my mind about marrying the rabbi. Maybe the marrying part, but not the rabbi part." Dawn Darwin Weaks, pastor of First Christian Church (Disciples of Christ) Rowlett: "It's really not very different than two doctors, or two lawyers, who are married to each other. It's kind of neat that we share the same vocation. Joseph Weaks, pastor of Bethany Christian Church (Disciples of Christ) Dallas: "I take the back seat and show respect for her authority. It's important for me to be mindful of that in our society, which is still patriarchal."